Kelly picking herbs in the herb bed in August 2008 when the little garden was at it's best. When she was in CT for her summer vacation, we stopped here every other day for fresh herbs for the next day or two's meals. 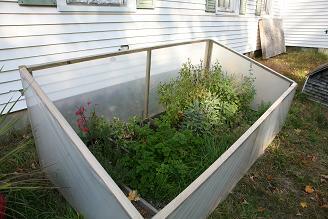 The cold frame in better days before the first winter the herbs endured. Two years of neglect and the cold frame getting destroyed from an avalanche of snow off of the roof of The Church (my house) took their toll on some of the perrenials. 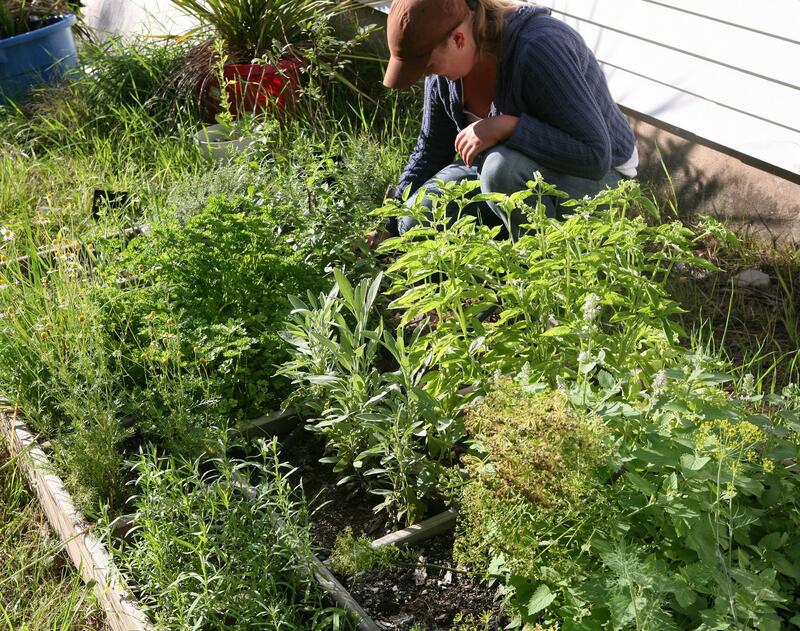 reclaiming the herb bed seems like a worthy task and is a sybolic gesture in a much greater project. 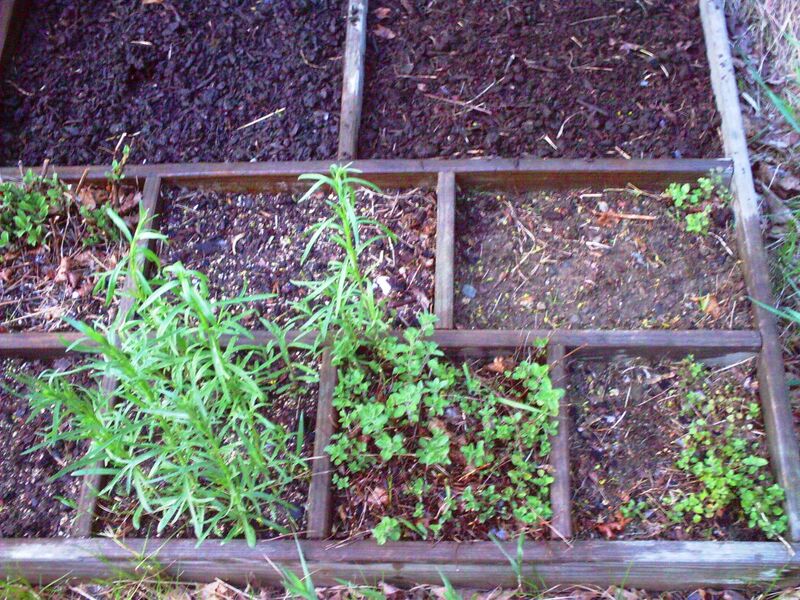 Inside the cold frame, even the tender annuals were fresh and green well into December! When I was devoted to the gardening cause way more than I am now, I used to see how many varieties of vegetables I could have available for Thanksgiving dinner. The herb garden was a way to relive that. I even had plenty of fresh herbs for the Christmas/New Years beach trip. Nothing like clam chowder made with our own clams and fresh thyme and oregano from the garden. 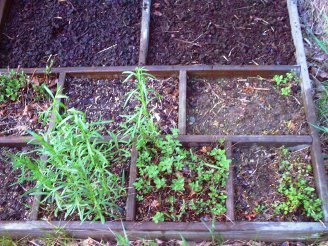 Tarragon, Oregano and Marjoram that survived the cold-frame disaster of last winter. Flat and Italian Parsley are planted in the rows behind and Basil and Parsley in the big sqyares behind. Waiting for Mint and Catnip in the far right compartment to reappear. I never get tired of fussing with the herb garden even if I do nothing else gardening wise. Thyme is coming back after a tough winter and dill and basil were planted today (seeds) in the back row. Front row is some errant thyme, mutant reseeded scallions with new baby scallions from seed coming up, a purchased rosemary plant and the trusty old chives. 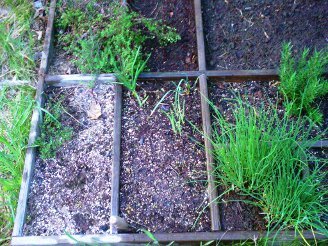 The chives, rosemary plant and the sage that I though for sure was all done. 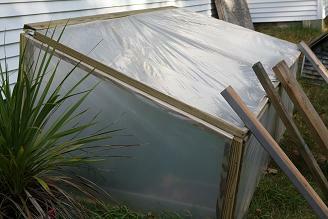 The coldframe was destroyed yearly last winter by a massive avalanche of ice off the roof of the church (my house) and most of the perrenial herbs took a severe beating. I usually pick herbs for Christmas and New Years at the beach, but this year was a disaster! With the coldframe acting as a hothouse, I usually bring fresh herbs to the beach for Kelly's birthday in March for chowder and pea soup at least. This year and next will be different. I'm back on it like stink on s**t.
The herb bed had become a small island of success in a sea of turmoil before a year of neglect and last winter nearly wiped out the whole project. Having moved back to the neighborhood since selling the Train Station, I decided that the first order of business is to reclaim the yard and get all of the plantings under control again. 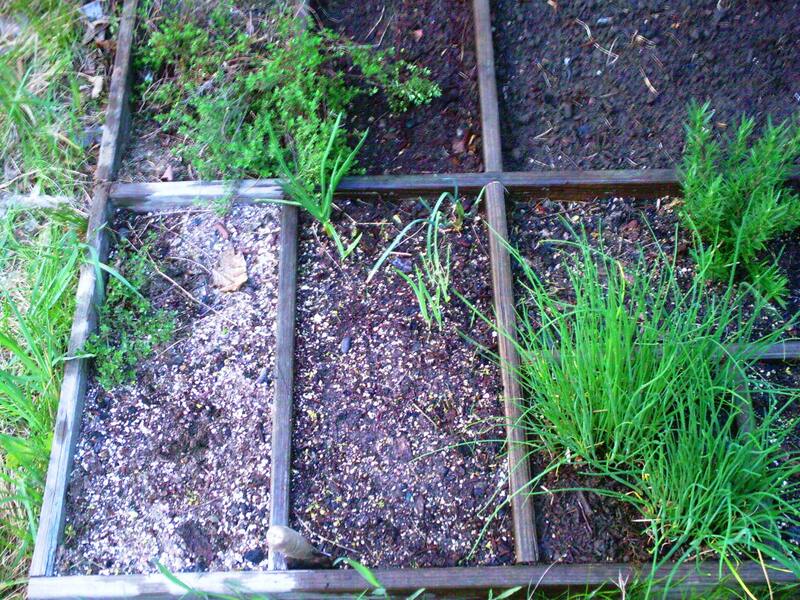 The herb garden seems as good and anchor point as any, and the rewards are obvious. I check it every morning before I leave for work or errands and again every night when I return. 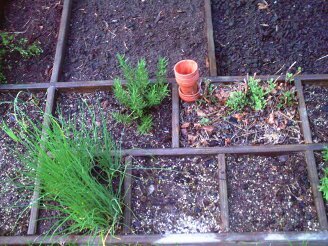 The herb bed might not be the most important aspect of rebuilding my real-estate life but it's always nice to have thyme and parsley for the important clam chowders and tarragon for C.W.S.O.G. I always try and make chowder for Thanksgiving and Christmas or New Years. We didn't get to put up as many clams last year so we'll have to ration the rest of them carefully until we can get clamming this year. Herbs we'll have plenty of. A handful of fresh herbs can make any cooking experience more memorable, and certainly helps the dining experience. Every little bit helps. Try this recipe for Steamed Clams in the Danger Kitchen Online Cookbook. Fresh tarragon kills in C.W.S.L.O.G. (Chicken With S**t Loads Of Garlic). This recipe for a Warm Mussel Salad is a Danger Kitchen favorite. Have a bread machine? Try Herb Bread with fresh herbs. I plant scallions in the herb garden for Beef With Scallions. This was supposed to be a dish made with a whole salmon, which was on sale at Beit Brother's Supermarket, but alas they were out. It turned into @#$&% Beit Bros. Out of Salmon Chicken which was very satisfying on cold February night. Baked Fish And Vegetables is the most popular recipe in the Danger Kitchen Online Cookbook. Making slow and steady progress. 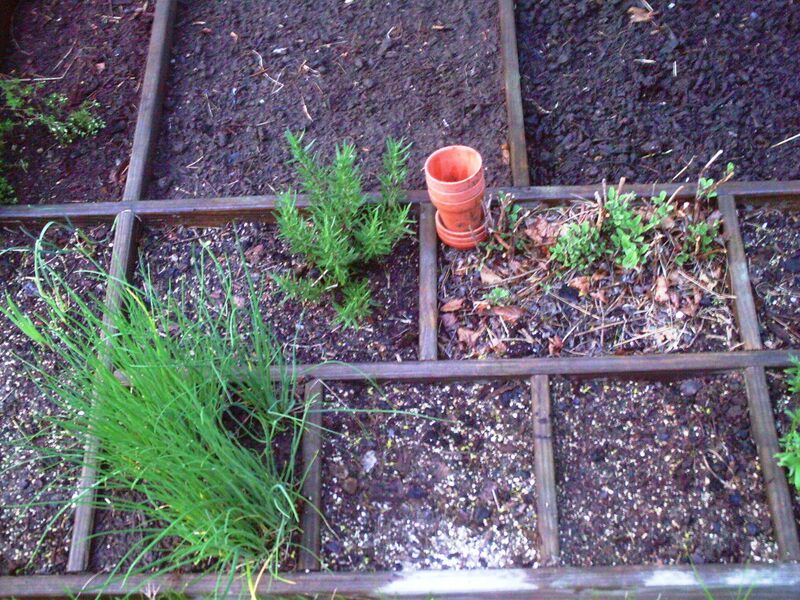 The herb garden is recovering nicely from two years of neglect and a rough winter. I make a point of checking it every morning before I leave for work or start the days chores and I check it again when I return... Water and weeding as necessary. It has once again become a daily ritual and an anchor point from which each day swings as the winds and tides of my situation change. Something as simple and as inexpensive as this little garden can become a great source of contentment and pleasure simply by turning it into a ritual to be included in the days activities. There are far too few rituals left to us as a society so we need to make our own as necessary. A simple ritual makes no demands other than participation and rewards with a sense of accomplishment that didn't require a "to do" or shopping list.